Although coconut shells do have some well established niche market uses such as novelty swimwear and small caged-pet shelters, I can’t help but to feel as though too many of them are going to waste. No I don’t mean as a mint holder, but as an improvised homebrew electronics project enclosure. The Altoids tin does make a nice project case. It has a hinged lid, giving you easy access to your business, a great pocketable form factor, and of course they are everywhere for free. But despite these merits, I think that the ubiquitous mint tin has been used to excess, and its use may be nearing the saturation point. I have a hunch that the coconut shell might just turn out to be the next big thing. 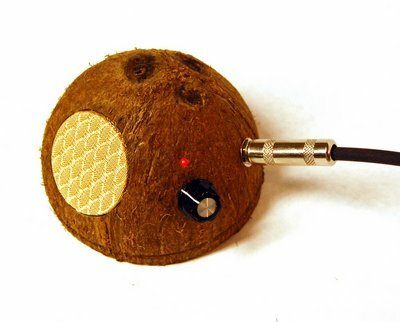 When I was recently trying find an enclosure for the ukulele amp that I was building, a coconut came to mind, and I don’t think that I could have found a better case. In addition to the obvious thematic tie-in with the ukulele, the coconut shell has a number of other redeeming qualities. The shell is hard and durable, easily machined, has a pleasing organic texture which can be left hairy, sanded smooth, or anything in-between. The little brown dome of a half-shell is cute as a bug, bringing a smile to all who see it. The dome shape is extremely stable and tip resistant. I could go on all day. This entry was posted on Wednesday, April 9th, 2008 at 7:21 pm	and is filed under Debris, Miscellany, Ukulele. You can follow any responses to this entry through the RSS 2.0 feed. Both comments and pings are currently closed. gilligan, the skipper too, the movie star, the millionaire and his wife, the professor and mary-ann would all be very proud of this innovative use of the coconut shell. Yes, I think that after Merlin Mann drove this hillarious first nail into the coffin of Steampunk, the time may be right for the Gilliganpunk aesthetic to emerge in earnest. Did you dry that nut out first? I only ask because I made a garment once out of a coconut and the shell cracked when it dried exposing the items under the garment to some nasty pinching.